On Saturday morning August 17, 2013, Michele left this party we call LIFE. Her endless energy and constant positive attitude that inspired us all will continue to live on through her family and friends. Daughters, Heidi Wilson Yentsch (Andy) & Gretchen Wilson Ask (Mike), and grandkids, Tyler (10), Hailey (8) & Bode (1) will forever pay tribute to her passion for fun, friends & a really good party. Michele leaves behind brothers and sisters who will miss her dearly; Craig (Amber) Anderson, Dianne Randolph (Bob-passed), Brent (Elsie) Anderson, Debbie Murray (Tim-passed) & Ron (Marianna) Anderson. They will continue to entertain us with stories and memories of their sister Michele. Michele lived to ENJOY LIFE & HELP PEOPLE. Whether it was golf, skiing, planning parties, being with her grandkids, friends or family, her motto was always HAVE FUN. She loved to help people and would go out of her way to help a friend and stranger alike. We could not have had a better Mom, she taught us the important things in life; sharing a glass of wine with a friend, the ability to laugh at yourself and not to worry about the little things. She was always there when we needed her, she always knew what to do and how to help us. These are gifts we will carry with us forever. For five years Michele lived with ovarian cancer. She fought this disease with the same attitude and energy that made her battle easier for us all. She did not let it get the best of her. She was an inspiration to her family and friends, doctors, patients and strangers she met every day. We sincerely thank all of Mom's Doctors, Nurses, and Caregivers at Huntsman. Thank you for giving our Mom all of your professional care and human compassion, you helped not only our Mom, but us as well. Please remember what was important to Michele and what made her so special to all of us - keeping friends and family close, her grandkids, her "other kids" (nanny kids), garage sales, her knack of mispronouncing words and changing everyday phrases that made us laugh, her ability to laugh at herself louder & longer than anyone else, that incredibly contagious smile, raising her glass and toasting to everything and everyone, enjoying lightning storms & sunsets, always being prepared for an adventure even when that wasn't the plan; anything, anytime, anywhere! We would like to invite family & friends to join us for "TEAM PUNA", 7th Annual, "Run for her Life", The Susan Sandoval Run for ovarian cancer, September 7th, 8am, Sugarhouse Park. THIS YEAR'S RACE IS DEDICATED TO MICHELE. If you would like to register for TEAM PUNA and/or make a donation please consider the University of Utah Depart of Obstetrics & Gyn- www.medicine.utah.edu/obgyn/ssrun & visit the FACEBOOK link to see the dedication to Michele. Celebration of Michele's life to be held September 28, 2013. Always remember Michele by "paying it forward". Remember to keep in touch with friends, family & help others when you can. That is how she lived her life. Saturday, August 17, 2013 4:07 p.m.
We are not going to write a lot today. We are going to take a day to rest and reflect. Thank you all for all of your calls, emails, texts and comments. Please understand we will not be able to get back to you right now. This is a tough one, we don’t have an etiquette or rules book to guide us through so we will handle this the best we can. We know that all of you need to heal and talk and cry and feel connected. We need that too. As we said before, we are honoring Mom’s wishes and will not have a funeral but a CELEBRATION OF LIFE for her. We do not have a date, or even a time frame at this point, but we will be discussing that in the next few days. We are thinking early Fall possibly. Some of you may be wondering about her wishes, she donated her body to science, the University of Utah. We will receive her ashes sometime in the next couple of years. It’s hard to tell you not to send flowers, but you know our mom, she did not want anyone to spend their money on something that would die. We are not asking for donations to any charity, however we know that some of you want to do that and you need to make that decision for yourself. When considering what you want to do please keep our Mom in mind…….maybe you can take a bottle of wine to a friend you have been meaning to call and keep putting it off because you are too busy, maybe you can throw a party for a group of friends you have been meaning to get back in touch with, maybe you could call a friend who has kids and offer to baby sit for them for an evening or morning so their parents could have a break……these are all “donations” that Mom would love you to spend your time and money on. Be creative, think of Michele, do what makes you feel good. The adage “pay it forward” is a relatively new term, however our Mom really invented it. We will tell you again and again how much we love Mom’s friends and family and appreciate all of your thoughts, stories and memories. Thank you, thank you! Make a point of telling your family today how much you love them! Give them a hug and hold on a little longer! At 2:10am Mom passed. She was surrounded by Heidi, Gretchen, Mike, Debbie, Dianne& Anita. We had a toast to her as she would have wanted that. We are okay. The pain of losing her is so unbearable yet we are relieved that she no longer has pain. We will write more later. Thanks for the heads-up yesterday about your truly wonderful mother. I thought you might be interested in the notice that I sent out last night to more than 300 of her classmates. Not all knew her, but I assure you they all know of her and the many challenges she has dealt with over the years. Here’s what happened Saturday night at our 50th Reunion. I was about to introduce the Reunion Committee. 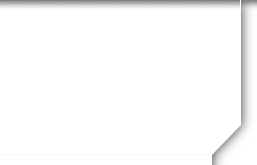 I clicked to the first slide (it’s in the email below). As the images of your mom filled the screen and before I could say a word all 300 people in the ballroom stood, cheered and applauded. They remained standing while I talked about her. It was quite something. While rehearsing the presentation earlier in the day – only a few were present – I choked-up visibly and audibly. I was embarrassed until I noticed the others in the room – including Don Riplinger the conductor of the chorus at Skyline when your mom was there (later he conducted the Mormon Tabernacle Choir)—were dabbing their eyes as well. The bottom line is this: your mother was an extraordinary woman, loved by many because she cared so deeply for them. And, in case you overlooked it, she was extremely proud of you two. No one will ever love and adore you more. "Let’s begin with Michele Anderson Wilson, the honorary chair and indomitable spirit behind all of our reunions, the veritable studentbody mother of Skyline, inspiring us this time around from home where she has been battling cancer for the past five years. “Michele couldn’t be with us tonight because she is at home still battling. Will you please stand with me to celebrate her life and considerable influence on all of us. Michele, we wish you Godspeed for the road ahead." Those who were there will recall that our classmates stood, applauded and cheered as I spoke her name and remained standing throughout the brief tribute. It was a stirring salute to a woman who has meant so much to so many over the years. Michele's cancer was diagnosed five years ago. She'd worked several jobs throughout July of 2008 to pay for a daughter's wedding. She figured her weariness was the result of over work. A week before the 45th reunion, doctors delivered the bad news. Surgery was scheduled a day or two after it ended. She said not a word until the reunion was over and then she swore me to secrecy. That's the kind of woman she was. "Michele couldn’t be with us tonight because she is at home still battling. Will you please stand with me to celebrate her life and considerable influence on all of us. Michele, we wish you Godspeed for the road ahead. “Okay, now exhale. But only little. “What most of us didn’t know was that Michele Anderson Wilson lived alone in an apartment on all the way through our three years of high school. Actually, by the time she got to high school she was quite well prepared as she had been living on her own, more or less, since she was twelve. 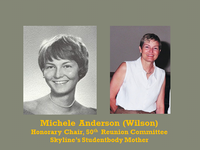 No surprise that to this day, Michele Anderson Wilson has been the Studentbody Mother to everyone who transferred to Skyline senior year and a lot of us who remained behind at Olympus, rounding them up every decade or so for reunions like this one. Michele is survivor, and another lifetime contributor to the world. Click here to see Michele's last Profile entry.